I love Yu Gi Oh cards. This is not something I ever thought would happen, but it turns out they are the perfect bribery for fiddle practice. Asher plays the fiddle. This is his second year at it. He’s got some natural talent, which means that last year was pretty easy for him, which means that he liked practicing then. When you get something on the first try and everyone is impressed, it is fun. This year, he has to work a bit harder and Asher doesn’t like work. 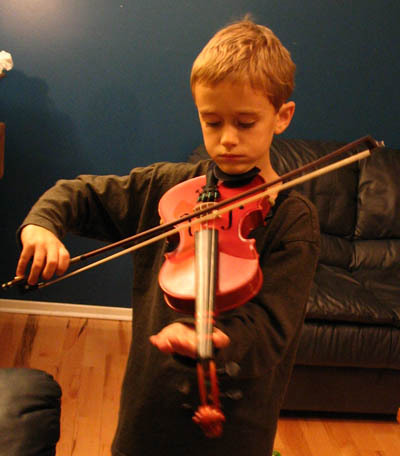 Once he gets started on practicing, he usually does just fine. J and I call it’ going into the zone,’ where he suddenly starts to concentrate and play beautifully. But getting him to that point can be tough, especially for a boy who normally has the attention span of a gnat. ‘Practice now and one day you find it easy again’ doesn’t do it for him. ‘Practice now and you will get this Yu Gi Oh card I am waving in your face’ does. I believe in politically correct terms, we aren’t supposed to call this using ‘bribery,’ but rather, using ‘incentives.’ Whatever. It works. So I get to be the cool parent, but J gets the last laugh, because man is that stupid game boring.